Companies and Utilities since 1993. The Legal Kiosk™ is the name of Emergent's suite of portals designed to simplify and share documents with clients easily and securely. Hosted in Canada by Microsoft, the Legal Kiosk™'s modules include Emergent's famed Virtual Minute Book for corporate records, a Virtual Vault for wills, and electronic books of documents for residential real estate, commercial real estate, intellectual property, litigation and many other areas of law. Documents stored within the Legal Kiosk™ are visible on virtually any phone, tablet or computer. Documents can be accessed anytime and from anywhere there is an internet connection. 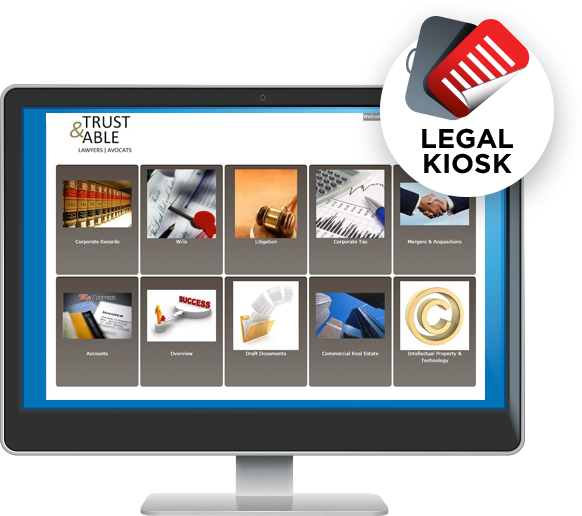 The Legal Kiosk™ may be used on its own at a disbursable cost of $25/File/yr, or you may add the Legal Kiosk™ to your Annual Subscription of any disbursable Emergent product at a substantial discount. Easy-to-use software to manage legal entities and produce minute book documents. Easy-to-use, intuitive and customizable Will drafting program. Easy-to-use software for administering contested or uncontested Estates. Easy-to-use accounting software for Estates, Trusts, Guardianships and Powers of Attorney.